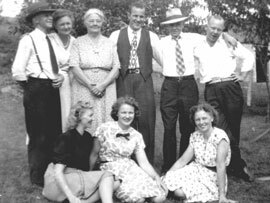 Although Gottfried and Friedrike Pagel's descendants seem to make up the largest Pagel family in Texas, we're not the only Pagel family here. Some of the families are listed below. If you are researching one of these families and have a correction or need the name of someone else researching one of these families, please contact Rox Ann Johnson. Joyce Stancik is a descendant of Wilhelmine Pagel Stockton and researches this family. Annie Marie (5 Jul 1890 - 16 Oct 1937) married ? Ella Bertha ( 10 Jun 1896 - ?) married ? After Emilie died William Pagel married Lydia Voelkel in 1913 in Lavaca County and later lived at Bishop. 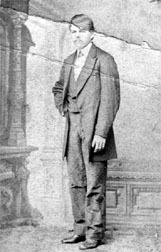 Descendants of this William Pagel include the owners of the Pagel jewelry stores in Round Rock and Temple. Caroline Bendikt Koch Pagel's first husband was Friederich Koch. Their children were Caroline, who married Julius Schmidt; Wilhelm, who married his step-sister, Anna Pagel; Friederich, who married Caroline ? ; Louise, who probably didn't marry. These children are all listed with the Pagel surname in the 1870 Colorado County census. 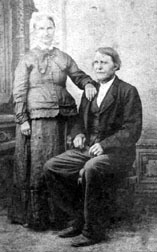 Fred Pagel and Richard Temple are descendants of Gus Pagel and research this family. 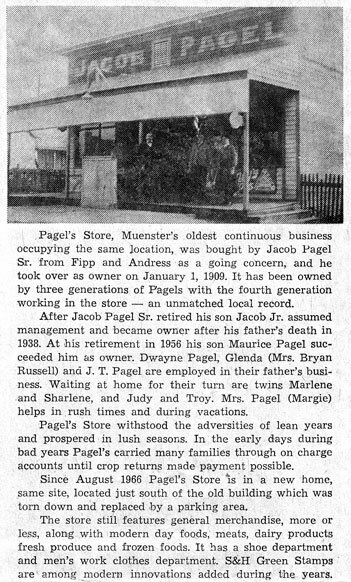 Sam Pagel contributed this article about the Jacob Pagel Store in the June 29, 1973 Muenster State Bank Anniversary issue of The Muenster Enterprise.